We are a residential architecture firm specializing in classic shingle style and New England seaside designs throughout Rhode Island and Massachusetts. We collaborate with our clients to design new homes, renovations and additions that respond to their wants and needs. At the first meeting, we involve you in the design process. We design your project together! Once the design is completed and in the computer, you can experience your new home in 3D. We can walk through each room and really feel what it will be like. Our clients receive personal attention from the beginning of design through construction. We help you prepare for Town and State requirements and can aid in the selection of engineers and contractors. We continue to represent you during the building process. We believe in effective communication between all parties involved. A team approach between the Owner, Architect, Engineers and Contractors is a key component in making this process go as smoothly as possible. A4 Architecture + Planning is a full service professional architectural firm specializing in high quality residential, commercial and institutional design. At A4, we are committed to creating high quality design that is carefully detailed and responsive to project requirements. We believe that every house, store, office and building comprises a portrait of the physical needs and aesthetic aspirations of that particular client. We are registered to practice architecture in the states of RI, CT MA & NY. Founded in 1988, Andreozzi Architects specializes in historically based residential architecture, expressive of its sense of place, attentive to its detail and proportion, and timeless in its beauty. Commissions exist from Commonwealth Avenue, to the shores of New England, to the Bahamian Islands. Florida and Islands work will soon be centered out of Palm Beach. We are a unique team of design-oriented architects driven by a passion for creating elegant architectural solutions that address our client's needs and desires in ways that are innovative, respectful of tradition and craft, yet respective of budget. The size of a project or cost per square foot is irrelevant in our quest to produce successful projects and happy clients. David Andreozzi is the AIA’s National Chair of CRAN, the AIA’s Custom Residential Architects Network. In addition to that role of leadership, David is personally spearheading CRANtv, an internet based series of viral videos that educate the public on the importance of good design and the role of the Architect, which is receiving national accolades. Locally, David currently sits on the board of the New England Institute of Classical Architecture and Art. Everyone at Andreozzi Architects works in small groups in direct partnership with David Andreozzi throughout all phases of the architectural process. We believe that small teams can achieve greater things than individual egos. In the design process, it is our responsibility to understand each client’s objectives and balance the practical and necessary into well-crafted, timeless architecture. Our designs serve to combine qualitative and quantitative needs into a meaningful and lasting solution. We believe our strength and success as designers is our commitment to our clients to provide close attention to contextual needs – family, budget, site and environmental - with contemporary ideals. We work together to create places which contribute creatively to the lives of those for whom we design. Every project, interior, exterior, garden or furniture, new or preservation, have their unique design goals and character. Guiding design to reflect on today’s lifestyle while respecting traditions, quality craftsmanship, and details of the “old”. Designing for the needs of our clients is our main goal. We aim to provide our clients with our knowledge and expertise of how appropriate design can work for their families, their businesses and their communities. This generally means that we hope to spend a little time getting to know you and your family, your business and your community. We believe above all in the value of our process. As we listen to your dreams and concerns, we develop plans that respond directly to your needs. Through our collaborative process, we are able to impart the experience and expertise of all of our designers to every project, which in turn can lead to more creative solutions. We strive to enrich your experience with space, light, materials, and craftsmanship through design. Good architecture not only provides functional space, but acts as a lens through which we view, understand, and appreciate the natural and man-made world. We believe architecture should be harmoniously linked to our environment. As a result, we employ creative energy and resource efficient design strategies to actively practice environmentally responsible architecture. We believe architecture is an art and a service, and most importantly that good clients make good architecture. The quality and body of our work is a reflection of our philosophy and the relationship we encourage between client and architect. We'll act as your advocate to set priorities, guide you through the construction process, help you choose a contractor, and work right alongside you until completion. From renovation projects to new construction for residential or commercial properties — we design for the way you live. We pride ourselves in our ability to translate your desires, dreams, and personal aesthetic into architectural reality. With an open mind, thoroughness, and intent on efficiency and budget awareness, we'll put our expertise to work for you. Our goal is to help you find creative solutions that meet your needs and realize your vision. BTGA is known for our fine design and residential problem solving. We listen to our clients and use our "Whole House Vision" system to design individualized homes that are great to live in. When you are starting the process of changing your existing home or building a new one, we are happy to do a low cost initial consult to get you on your way. Often this information can help clients move from indecision to an initial plan of action. We create award winning new homes, design additions to and renovations of existing residences, and also adapt other structures such as carriage barns and lofts for residential use. Our office has a background in historic renovation as well. Our projects span a wide range of sizes, from tiny to grand. We can help you make the changes in your house that will make it easier to live in as your family grows – and as you grow older. We specialize in contextual design in established neighborhoods, and design houses that respect their surroundings. All BTGA homes are good neighbors, and appreciated as beautiful additions to their surroundings. Our work spans Providence, Newport, Barrington, Westerly, South Kingstown, Jamestown, Little Compton, and elsewhere in Rhode Island and neighboring Massachusetts. Architecture firm on the East End of Long Island. Equally versed in modern and traditional building typologies, we know a successful building focuses the advantages of its site and enhances the life of its occupant. We have experience in commercial, institutional and ecclesiastical architecture, but our specialty is the design of the home. Our goal is the creation of houses that celebrate their locations and are inspiring, relaxing, and suited to the lifestyles of our clients. How do I find the best Ledyard architect for my home design project? It is best to hire a home architect who will be involved in all phases of the design process, from the initial concept to the completed construction. The architect is often the first person you will hire for your project. If necessary, they might also help you select and hire Connecticut subcontractors, which can include the builders, engineers and landscaper. Interior architects are also involved in negotiating contracts for all involved participants. It is for these reasons that it is extremely important for you to have a good relationship with the Ledyard residential architect you hire. He or she can be the tie-breaking vote between you and the general contractor and can be your biggest advocate during the construction process. Different architecture firms in Ledyard, CT provide different services, so the scope of the work can span from pre-design environmental impact studies to selecting furniture and finishes, depending on what your specific needs are. It is very important to hire the right professional for the job. Remember that the most well-known or established designer might not provide the best architectural services for your needs. It all comes down to the individual project. Research and ask people whose work you like for recommendations. It's important to have somewhat of an idea of the style of house architecture that you prefer, as well as the amount you would like to spend. 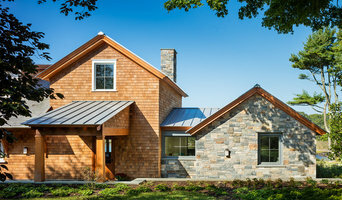 Residential architects in Ledyard, CT are natural problem solvers. They will assess the entire situation and help you to solve your problems too. Don't settle for a single company too early. Call and interview a few. Make sure that you feel like your personalities will mesh well and that you like their professional perspective. 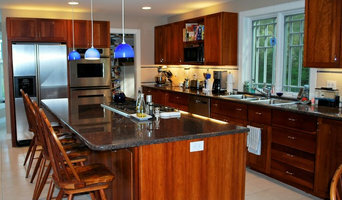 Find a home architect in Ledyard, CT on Houzz. 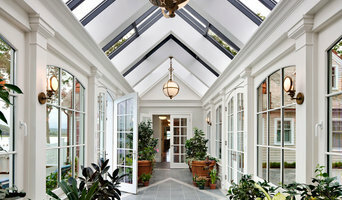 Narrow your search in the Professionals section of the website to Ledyard architects. You may also look through photos of Connecticut projects to find interior architects and building designers who have worked on a project similar to yours.